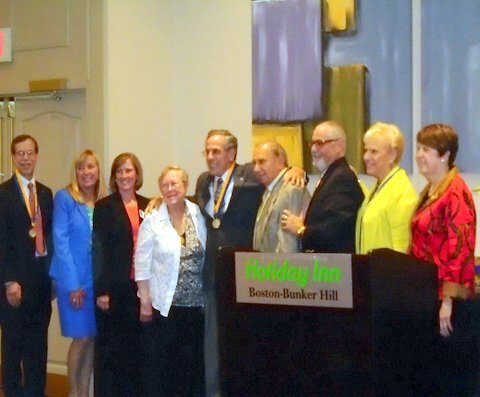 Superintendent Tony Pierantozzi was awarded a Paul Harris Fellowship at the Somerville Rotary Club's June 4th Installation Dinner at the Holiday Inn. Paul Harris was Rotary's founder in 1905 and the award is given to individuals who meet high professional and personal standards set forth by Paul Harris. Pierantozzi has been a member of the Somerville Club since he became Somerville's superintendent in 2005. "Harris used to say, " We thank you for your fellowship and friendship" and that's how we all think of Tony," said Ann Kirby who presented the award. "Tony has served his profession, our community, and the club. He has made a difference in making us the Club we are today." Pictured left to right are all the Somerville Club's Paul Harris Fellows congratulating Pierantozzi at the dinner: Paul Kaufman, Jeannie Scarpa, Gilda Nogueira, Patricia Reardon, Superintendent Pierantozzi, former Mayor Gene Brune, Gene Ferraro, Grace Abruzzio, and Ann Kirby.